Happy New Year! Are you ready to see what 2017 holds? I know some of you are ready to leave 2016 behind in the dust. Yeah, I’ve had years like that, too. 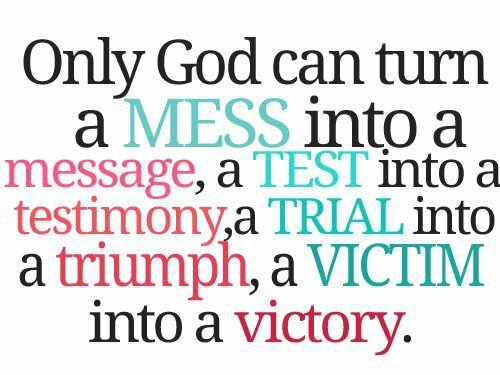 However, this picture I posted holds a whole lot of truth of what God can do with all of our mess. He turns it into something good. We might have to search for it on some days. We might have to walk minute by minute to feel the effects now and then. We might have to trust and believe when all hope seems nonreaching. But the goodness is there none the less. By the power of the Holy Spirit, direct my steps, Lord. ← Twenty Things I Love about You…. My grandfather used to say in his prayer, Lord I want to be so close to you that I can feel you breathing on me. I'm joining you in that congo line hopeing to bump into Jesus and let him breathe afresh on us.